Hydrogen Sulphide (H2S) is a colourless gas with a rotten egg odour which is commonly referred to as ‘sewer gas’. Hydrogen Sulphide is highly poisonous and highly corrosive in wastewater applications. There are various problems associated with hydrogen sulphide generation, such as toxicity, noxious odours, and the generation of corrosive sulphuric acid. Sulphur is present in human and livestock waste as organic sulphides, such as mercaptans and disulphides. It is also present in rainfall, primarily over metropolitan areas, but the most common source of sulphide is in domestic wastewater as sulphate. These sulphide-containing contaminants will either be oxidized (react with metals to form insoluble metal sulphides) or be released to the sewer. When sewage becomes stagnant H2S is generated in the anaerobic conditions. H2S can start to form sulphuric acid in lift stations and wastewater treatment plants, which will corrode cement and steel structures. 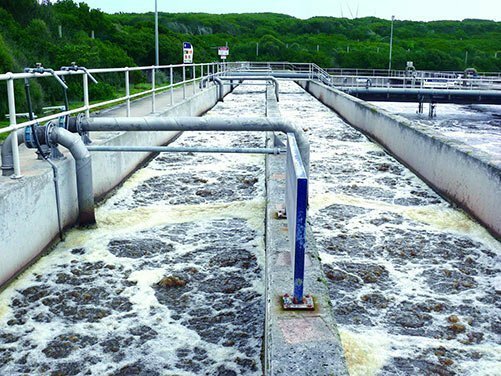 Hydrogen sulphide is a toxic concern for wastewater operators, especially if odour-masking agents are used, since it can affect the nervous system causing headaches, nausea, irritation of the skin, eyes, and respiratory tract. At high doses it can cause death. The high toxicity associated with hydrogen sulphide is due to its ability to bind to iron centers in mitochondrial cytochrome enzymes, which effectively stops cellular respiration and deprives essential organs of energy. Although humans do possess enzymes in the liver that oxidize hydrogen sulphide to sulphate, high concentrations of hydrogen sulphide will overwhelm human hydrogen sulphide oxidative enzymes. Many wastewater facilities that experience sulphide problems generally use aeration, chemical oxidizers, such as hydrogen peroxide, and/or odour-masking agents (essential oils), but these only mask the underlying problem and do not actually remove the sulphur/sulphide molecules from the system. The primary route of exposure is inhalation and the gas is rapidly absorbed by the lungs. People can smell the “rotten egg” odour of hydrogen sulphide at low concentrations in air. However, with continuous low-level exposure, or at high concentrations, a person loses his/her ability to smell the gas even though it is still present (olfactory fatigue). This can happen very rapidly, and at high concentrations the ability to smell the gas can be lost instantaneously. It is the health risks of H2S that is probably least realised and understood. Hydrogen Sulphide is both an irritant and a chemical asphyxiant, with effects on both oxygen utilisation and the central nervous system. Its health effects can vary depending on the level and duration of exposure. Repeated or prolonged exposures at even low concentrations may cause eye inflammation, headache, fatigue, irritability, insomnia, digestive disturbances and weight loss. High concentrations can cause shock, convulsions, inability to breathe, extremely rapid unconsciousness, coma, and even death. So how do you prevent H2S poisoning? Triple7 Odour Control is a readily biodegradable, non-toxic and non-corrosive, plant-based product, developed to neutralise H2S, strip wastewater pipework of effluent build up, separate fats, oils and greases out of solution and cause suspended solids to separate from the wastewater solution creating a ‘clean’ water discharge to the environment or wastewater authority.